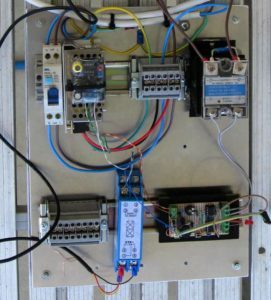 Above is a pic of the test panel in use to test the generic heating / cooling controller (hcctl), a flexible bang-bang controller based on an ATTiny25. The top row of the panel is essentially the single phase 230VAC components. From left to right a 10A/30mA RCD, a 12V 3A switched mode DC power supply (with a 24V DC converter tied to it for this test which includes a 4-20mA loop), a terminal block for 230VAC, and a 40A 480V SSR. The panel is cut into an ordinary 3m 10A extension cord, input from the plug end and the socket end controlled by the SSR. 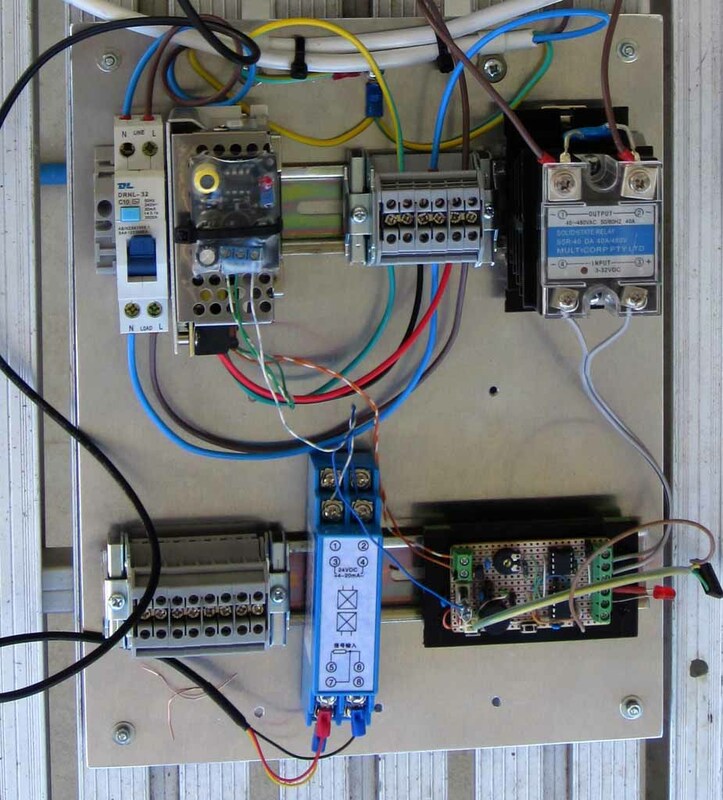 The switching device can be changed to a 230VAC relay, 12VDC relay, 5VDC relay to suit the module under test. Likewise the power supply can be easily swapped. The lower DIN rail is for the LV components, in this case a terminal block (spare), Pt100/4-20mA converter and the hcctl module being tested. If need be (eg for oscilloscope probe attachment to the 230VAC side), the whole thing can be run from an isolating transformer and a neutral-ground tie installed on the terminal strip. Above is a wider shot of the test where a pot with 1l of water is being heated by a portable stove, temperature sensed with a Pt100 probe and the stove controlled by the test panel output. The device at lower left is a data logger monitoring temperature with an independent thermistor probe. Above is the logged temperature for the test run. The controller SV is 40° and differential 5°. (The EEPROM SV is actually 44° to compensate for measured 3.8° error @ 40° in the Pt100 sensor which as a Class A probe should have error less than 0.23° – cheap Chinese junk, and residual error in the 4-20mA converter, the sense resistor, and the ADC reference in the microcontroller.) There is a largish overshoot on the first cycle and just a little on the subsequent cycles, typical of a bang-bang control loop. Other accessories include a 15A/1V clip on current transfromer, a DIN rail mounted generic PCB clamp, and as mentioned, an isolating transformer. A warning though: don’t mess with this stuff unless you are competent, don’t take safety for granted, don’t allow access to persons who might not have the needed competency. Previous Previous post: What is a Ground Plane Antenna?